Sample job application for HR manager and HR Executive, HR officer available for free download. This application can be used for the post of human resource manager and human capital development positions. I would like to apply for the position of HR Officer at AH Foundation. I have a Certificate of Higher Education in Business and Professional Administration from UK. I have studied human resources management as part of my course. My qualifications are equivalent to a Bachelors Degree in Pakistan. Most of my education and work experience are from United Kingdom. Other then my administrative background I also have a lot of experience of working with people with special needs, learning disabilities, autism etc as a support worker in residential and also educational settings. I think my administrative background along with my knowledge and understanding of special needs makes me more suitable for this position. I have full knowledge of all human resources procedures along with very good interpersonal, communication, English language and IT skills. Please find my CV attached for your consideration. In response to your advertisement in the news paper I am sending my this application for the post of HR Manager along with my educational and experience certificates. 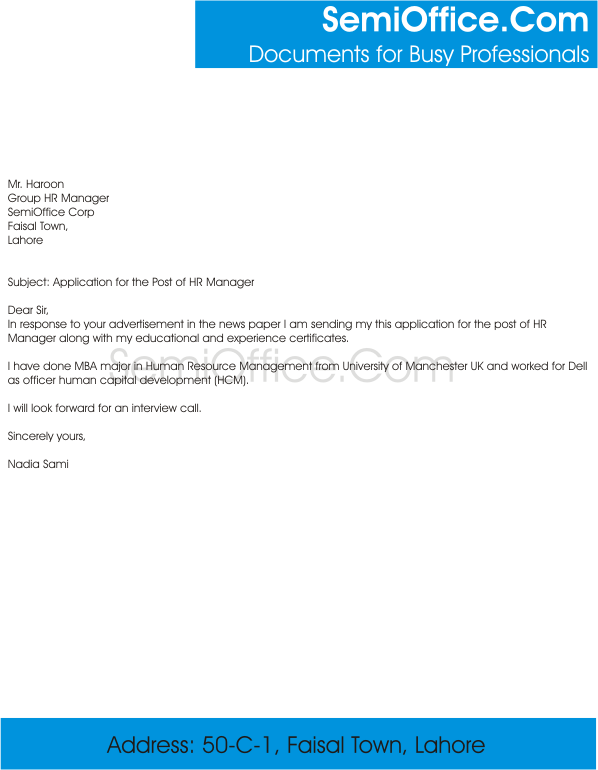 I have done MBA major in Human Resource Management from University of Manchester UK and worked for Dell as officer human capital development (HCM). I will look forward for an interview call. Your advertisement for a Human Resource Officer interested me because your requirements closely parallel my working experience. I’ll be happy to tell more about my experience in an interview.I attach my C.V and cover letter with this E-mail.I shall be very grateful to you. I hope that this emails finds you well. Please find my resume attached herewith for the post of HR OFFICER. Wow thanks sir, just have got a big help.